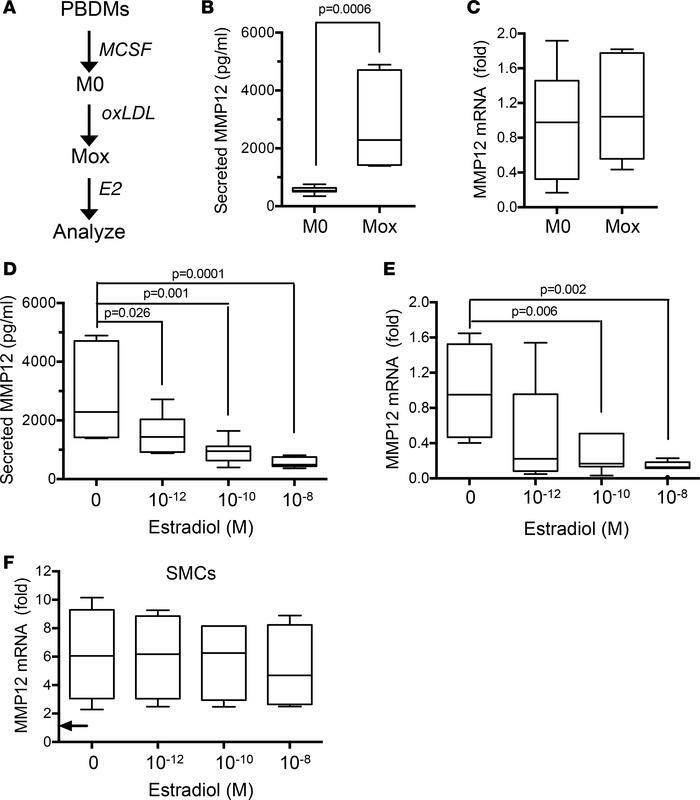 Estrogen inhibits MMP12 gene expression and secreted MMP12 in human Mox macrophages. (A) Schematic of the experimental design. Female human peripheral blood–derived monocytes (PBDMs) were differentiated into M0 macrophages, treated with oxidized LDL (oxLDL), and exposed to selected concentrations of E2 as described in Methods. (B and C) Effect of oxLDL on the amount of secreted MMP12 and MMP12 mRNA, respectively, in M0 versus Mox macrophages (n = 7 per condition), with statistical significance determined by Mann-Whitney test. (D and E) Effect of E2 treatment on the amount of secreted MMP12 and MMP12 mRNA, respectively, in Mox macrophages (n = 7 per condition) with statistical significance determined by ANOVA. B–E show results from experiments that contained all conditions but are separated here to better emphasize distinct points; Mox samples lacking E2 in B and C are therefore the Mox samples without E2 in D and E. (F) Effect of E2 treatment on MMP12 mRNA levels in human SMCs stimulated with 20% FBS (n = 4). The arrow indicates the MMP12 mRNA level in the serum-starved cells before FBS treatment. Statistical significance was determined by ANOVA. Graphs show box-and-whisker plots with Tukey’s whiskers; the horizontal lines of boxes represent the 25th percentile, the median, and the 75% percentile.